This Quick Start sets up an AWS architecture for SIOS DataKeeper Cluster Edition and deploys it into your AWS account. 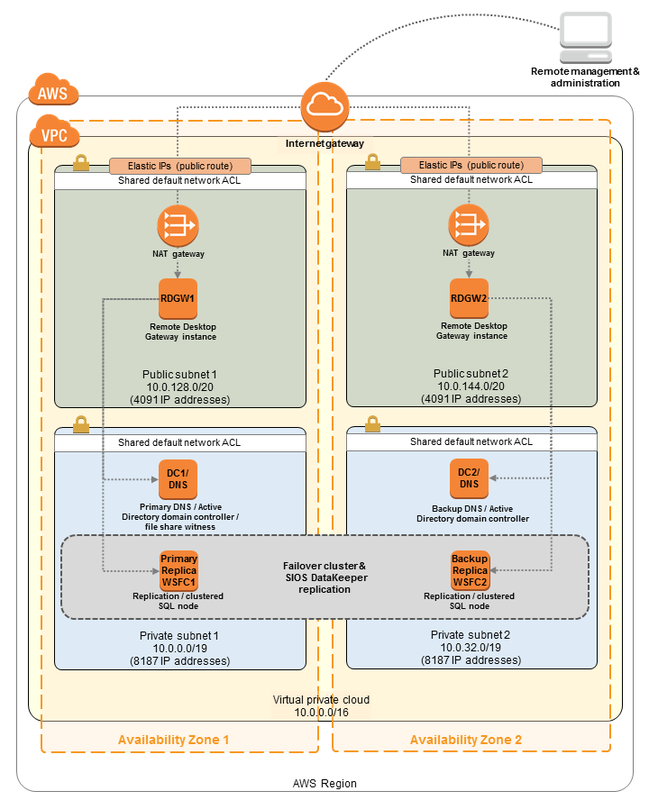 This Quick Start uses AWS CloudFormation templates to deploy SIOS DataKeeper Cluster Edition into a virtual private cloud (VPC) in a single AWS Region, across two Availability Zones. This Quick Start was developed by SIOS Technology Corp. in collaboration with AWS. SIOS is an APN Partner. In the private subnets, two cluster nodes featuring SIOS DataKeeper replication software and SQL Server 2014. 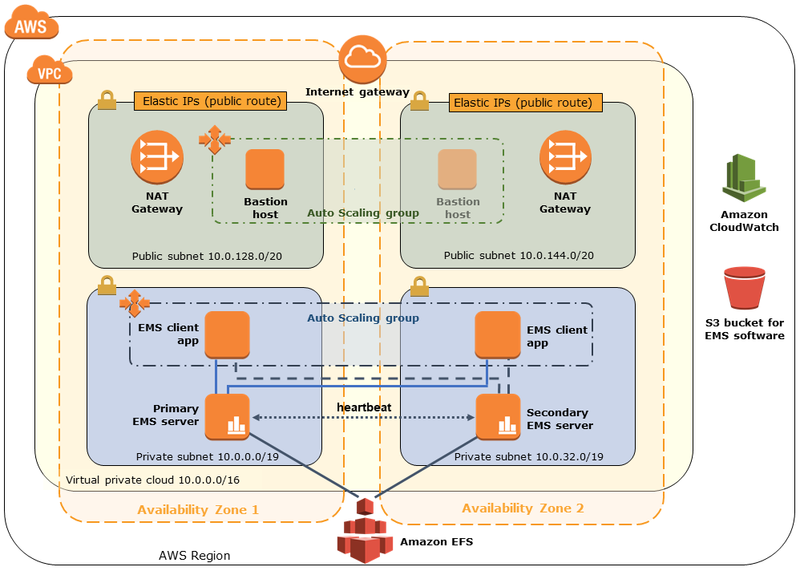 VPC Single AWS Region with two Availability Zones. Instance type Minimum recommended: m3.xlarge. Operating system See the DKCE Support Matrix. Elastic IP An Elastic IP address connected to the Remote Desktop Gateway server. Instances Four instances: two DNS / Active Directory domain controllers and two SIOS DataKeeper / SQL Server cluster nodes. SQL Server Elastic network interface (ENI) with three IPs for each SQL Server instance. The primary ENI IP is statically defined in Windows and used by SIOS DataKeeper Cluster Edition. Two IPs are maintained by Amazon EC2, and used by WSFC and SQL Server 2014. Volumes Two volumes (Amazon EBS and NTFS only): one primary volume (C drive) and one additional volume for replicated data storage. Launch the Quick Start. You can choose from the following two options. Deployment into a new VPC takes about three hours; deployment into an existing VPC takes about two hours. Test the deployment by launching Failover Cluster Manager on one of the replication nodes, and switching over resources. To customize your deployment, you can choose different instance types for your resources; configure the data volume type, size, and IOPS for the SQL Server drive; and customize the Active Directory, Remote Desktop Gateway, and failover cluster configuration. Pay as you go (PAYG) — Use this consumption-based option to pay an hourly fee determined by usage. Current prices are listed on the AWS Marketplace page and billed to your AWS account. This option doesn’t require a license for SIOS DataKeeper. Bring your own license (BYOL) — Use this option if you have a current license for SIOS DataKeeper Cluster Edition (which requires a run-time license for each server). You can deploy the Quick Start without first signing up for a license, but you must have a license to start and run SIOS DataKeeper Cluster Edition. You can contact SIOS to request a run-time license or a 14-day, free, trial license.